EcoloBlue Atmospheric Water Generators – Worth It? Really Green? An atmospheric water generator is a type of water cooler which creates it’s own water by pulling humidity out of the air. Atmospheric water generators vary in how they are made, but generally, the process for extracting water includes an air filter, a condenser (like a dehumidifier), a water filter, an ionizer (sometimes), and a UV process to use light to keep the water pure. The most involved and complete process for generating water from atmospheric humidity (at least the most involved generator we know of) comes from EcoloBlue. Their process includes 12 steps for condensing air into water. 12 steps seems like a lot, but their system is really well thought out and makes sure that what ends up in your glass is really the best water for you. If you’re interested in how it works, I’m going to detail the process now. If you’re not interested, skip ahead to where it says In-depth description ENDS here. First the humid air is pulled from the atmosphere around it into the generator through an electrostatic air filter. The electrostatic air filter effectively prevents micro-particles and dust from entering your generator. The humid air then runs over the condensing coils, which have a food-contact grade coating. This ensures that there is not any metal contacting the water and also improves the efficiency of the production of water. Next, there is a nanometer carbon filter. This works like a sieve to remove ammonia, chlorine residues, organic compounds, any particles of soil or dirt, and any other solid particles that might still be in the water. Beyond that is the first level of UV Lamp Sterilization. Because the water is being stored in a storage tank, this lamp works to prevent the growth of bacteria or any other microorganisms. (If the bulb ever burns out, simply replace with Phillips (bulb type) TUV UV-C). After that is another filter. I’m really surprised at the number of filters in this system, but it’s exciting because you know you’re getting great water at the end. It’s the process that water takes when it percolates to the underground sources of water that are the best water on the planet. This next filter (filter #3) is a sediment filter. At this point, your water is sitting at the bottom of the generator, and has to be pumped back up to the top. Between the first storage tank and the water pump is filter #3 which removes micro-particles to protect your water pump. Then there are two levels of carbon filters. Carbon is one of the world’s greatest materials for filtration of water. These two stages of carbon filters remove organic compounds, free chlorine, and heavy metals. After that, your water is still being filtered, this time through a reverse osmosis membrane (And if you have to replace that, the part comes from FILMTEC – RO). This membrane removes dangerous bacteria, viruses, mineral salts, heavy metals, organic compounds, etc. After that is the second tank that uses UV light to sanitize the tank and water. This tank uses the same Philips TUV UV-C bulb, and even though your water is, at this stage, just about as pure as possible, this step constantly works to minimize bacteria levels in the upper “allotment” tank. One more UV Sanitizing bulb Philips TUV UV-C at the nozzle, ensures clean and safe water is dispensed from the cool water tank. And finally, ONE LAST filter. The nozzle itself is equipped with three molecular sieves (screens) to trap any fine particles that may still (though doubtfully) be suspended in the water inside of the generator. Are The Filters In EcoloBlue’s Atmospheric Water Generators Difficult to Change? You might think that with all of these filters built-in, the complexity of the atmospheric water generators from EcoloBlue would make the filters difficult to change out. Or you might assume that EcoloBlue would charge a lot for the UV bulbs or the filters. I did when I first heard about them. But neither is the case. The filters and bulbs are pretty standard on price. The process for changing out the filters is pretty straightforward. The filters are easy enough to change. However, EcoloBlue’s manual seems to over-complicate what’s actually pretty simple. It would be really nice if EcoloBlue would post some YouTube videos or some training that was video based, just to really walk you through replacing the filters step-by-step. This would make the process for changing out the filters more obvious, by showing where the various filters are in EcoloBlue’s different models of atmospheric water generators. The filters only need replacing every 6 months (not often), and the bulbs should last 2-3 years. The long time between change-out times on the filters is good. (I don’t want to have to be cleaning or working on my water generator all the time.) If I only have to change the filters twice a year to know that I’m drinking fresh and pure water, that is really simple for me to do. EcoloBlue also has complete off-grid systems. This means that their water generators are set up to be powered by solar panels. They sell the proper solar panels (correct electricity rating), as well as the kits, in order to have a complete off-grid water generation system. 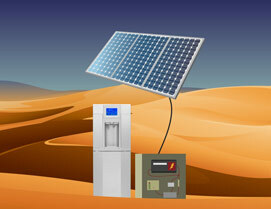 The solar panel powers batteries, which in turn power the water generator. If you do get one of these complete kits from EcoloBlue, in order to power your off-grid system all you’ll need to do is pick up your own batteries at a local hardware store or auto/boat store. The potential applications of a self-contained water generation system are limitless. When powered by the sun, even in dry climates, EcoloBlue has shown that their water generators can extract 1-3 gallons of water from the air. In humid climates, even their most basic model water generators have been able to create as much as 8 gallons of water in a day. EcoloBlue also makes water generators for commercial applications. (Think remote construction sites without wells, large events with many attendees, etc.) They have units available that will generate as much as 1500 Liters of water/day, storing up to 150 liters of water at a time. Compared with bottle services to your office, or having people carrying plastic water bottles around, EcoloBlue’s solutions are quite environmentally friendly. The water generators do generate some heat in the process of cooling the water, which means they’re using unnecessary electricity somewhere. And their filter cartridges do have to be replaced. However, if you’re looking for a way to make the planet a little greener while drinking really pure water (regardless of where you live or what your water supply is), we really do recommend you take a look at getting one of EcoloBlue’s Atmospheric Water Generators. Very interesting article. I work for another Atmospheric Water Generator manufacturer named WaterPure International, Inc. Our company uses a patented ozone water purification process because we found that the ultra violet light bulb really doesn’t purify all of the water. Also, our machine is the ONLY one Made in USA. Let me know if you would like to read some of the newsletters I write for our company. Hey Marty! Thanks for making the time to read about, and post a comment on, our post about your competition. I checked out your site. Your technology definitely looks different and is an interesting variation in approach to filtering the water. In what part of the USA are your atmospheric water generators manufactured? I am interested in this more for survival that being a green environmentalist. I would like to know when you expect this to be priced reasonably for the home consumer? I particular would like to knwo about a unit that is solar powered. The water tastes great but all the hassle to get it is definitely not worth it. I owned one for 3 years. Every week, I had to clean the thing, which took nearly an hour. Then I had to buy all the filters, UV bulbs, and other things, which are all very expensive. Every few months, some sort of problem would come up. I had to call them and try to figure it out. Over and over and over. The machine is also very loud, as it grinds away, morning, noon, and night. And boy, does it use electricity!! Finally, they told me to do a super-sanitation. While that was going on, the machine developed a leak. I could not find the leak because the darn front cover will not come off. There are screws but it is absolutely impossible to get to them. There are so many design flaws in the machine that it isn’t funny. Finally they told me to go find a big and sturdy box and ship it back to them. For the price of $300 they would try to fix it. WHAT? THEY caused the problem, and yet they expect me to go to all that trouble and expense. No, that was the final straw for me. I am done. Save yourself a ton of money, a ton of time, and a ton of hassle. DO NOT BUY AN ECOLOBLUE. In your research, have you found a company you would recommend instead of Ecoloblue for an Atmospheric Water Generator? Please send technical operating specifications and costs of your devices by email reply! You’ll need to contact EcoloBlue directly to learn more. Thanks for the review and the comments. We apologize to anyone who has experienced any problems with their machines, as these people are in the minority. We have over 10,000 units in use worldwide and we do not get a lot of complaints. We have also in the last year upgraded to a new quick change filtration system to eliminate some of the leaks caused by filter hoses not being inserted properly. We have also added to our solutions, machines that can produce from up to 100 liters/day of water, up to 10,000 liters/day. They can be bundled into our water stations that can produce millions of liters of water a day. We also have an emergency A.C.E. Container that has an AWG, power generator and bottling plant all in one for disaster relief. We are happy to discuss any problem, review any maintenance procedures, or just answer any general questions. You can reach out to us on the Contact Us link on our blog, http://www.ecoloblueblog.com or through our website.